Different states have different rules and regulations. 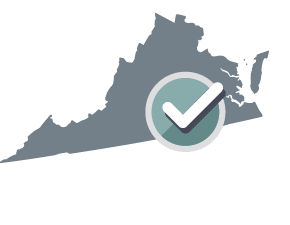 Your Real Estate Purchase Agreement will be customized for Virginia. When should you use a Real Estate Purchase Agreement?A Real Estate Purchase Agreement is a contract used to purchase completed homes. A buyer can use this agreement to purchase a newly constructed home or a previously occupied home. The Seller wishes to sell a certain completed home and the Buyer wishes to purchase this completed home. The Property is situated at _________________________________ and the legal description of the Property is as follows: _________________________________, which includes fixtures and improvements located on the Property and all rights, privileges and appurtenances associated with it, including but not limited to permits, easements, and cooperative and association memberships (the "Property"). The Seller agrees to sell and convey to the Buyer and the Buyer agrees to purchase from the Seller the Property. the total Sales Price payable is: $__________. The portion of the Sales Price not payable in cash by the Buyer amounts to $__________ and it will be paid by one or more third party mortgage or deed of trust loans. The terms of the Third Party Financing Addendum are incorporated into this Agreement by reference. This Agreement is not subject to the Buyer being approved for financing and does not involve FHA or VA financing. The Buyer will deposit $__________ as earnest money at __________ with __________ acting as escrow agent, on or before April 19, 2019. Failure to deposit the earnest money as provided in this clause will result in the Buyer being in default under this Agreement. At the Buyer's expense, the Seller will furnish to the Buyer an owner's policy of title insurance (the "Title Policy") from __________ (the "Title Company") in an amount of the Sales Price dated as of the date that the sale of the Property becomes final and the Buyer takes possession (the "Closing Date"), which insures and indemnifies the Buyer against loss as stipulated under the provisions of the Title Policy, subject to the following exceptions (collectively the "Title Exceptions") which includes: building and zoning ordinances; standard utility easements; standard riparian matters; common restrictive covenants relating to platted subdivision; oil, gas and mineral rights; taxes, mortgages or deeds of trust and assessments which the Buyer will be assuming; discrepancies in regards to shortages in area or boundary lines; and liens created as part of the financing for the Buyer. At the Seller's sole cost, the Seller will furnish or cause to be furnished to the Buyer a commitment for title insurance (the "Commitment") and copies of restrictive covenants and documents evidencing exceptions in the Commitment (the "Exception Documents") other than the standard printed exceptions. The Seller hereby authorizes the Title Company to deliver the Commitment and Exception Documents to the Buyer's address provided in this Agreement. Prior to the Closing Date and at the Buyer's sole cost, the Seller will furnish a new survey to the Buyer and the said survey must be made by a registered professional land surveyor acceptable to the Buyer, Title Company and any lender. The Buyer may submit a written objection, within 10 days after the Buyer receives the Commitment, and Exception Documents, in relation to any defects, exceptions or encumbrances to title which makes the title unmarketable, excluding the Title Exceptions. With the exception of the requirements in the Commitment which are not waived, if the Buyer fails to provide a written objection within the allowed time, it will constitute as a waiver on the part of the Buyer to object. Any timely objections by either the Buyer or any third party lender must be cured by the Seller, at the Seller's expense, prior to closing and the Closing Date will be delayed as necessary. If the objections are not cured, this Agreement will terminate and the earnest money will be refunded to the Buyer within ten days unless the Buyer has waived the objections in writing and elected to close the sale and accept the title with the existing defect. SELLER'S DISCLOSURE: The Seller does not know of any material facts that would affect the value of the Property, except those observable by the Buyer or any known to the Seller which are disclosed in this Agreement and the attached addenda. MANDATORY OWNERS' ASSOCIATION MEMBERSHIP: The Property is not subject to Virginia Homeowners Association Act. LEAD WARNING STATEMENT AND DISCLOSURE: Every purchaser of any interest in residential real property on which a residential dwelling was built prior to 1978 is notified that such property may present exposure to lead from lead-based paint that may place young children at risk of developing lead poisoning. Lead poisoning in young children may produce permanent neurological damage, including learning disabilities, reduced intelligence quotient, behavioral problems, and impaired memory. Lead poisoning also poses a particular risk to pregnant women. The seller of any interest in residential real property is required to provide the buyer with any information on lead-based paint hazards from risk assessments or inspections in the seller’s possession and notify the buyer of any known lead-based paint hazards. A risk assessment or inspection for possible lead-based paint hazards is recommended prior to purchase. The Seller will disclose all known lead hazards in the attached lead disclosure as well as furnish to the Buyer a copy of the pamphlet titled "Protect Your Family From Lead in Your Home" from the EPA and any available report on lead in relation to the Property. The Buyer at its sole cost, will be given at least ten days to inspect the Property in relation to lead hazards. This ten day period may be lengthened, shortened, or waived by mutual written consent of the Parties. COUNTY DISCLOSURE: The Seller is responsible for satisfying any local disclosure requirements prior to the signing of this Agreement. Please consult the local county department in which the Property is situated and/or a local real estate attorney to ensure compliance has been met. The Buyer may, at its sole cost, select inspectors and pest controllers licensed to practice within Virginia or any lawful agent authorized to make inspections to inspect the Property. The Buyer will deliver to the Seller a written notice of any defects in addition to a copy of the inspection report within ten days after the inspection. At all reasonable times, the Seller is to permit the Buyer or its agents access to the Property for the purpose of inspection and will pay for turning on existing utilities. The Buyer accepts the Property in its current state and condition without any further work, repairs, treatments or improvements. The Seller makes no express warranties aside from those expressly described in this Agreement or the attached addenda. Upon closing, the Seller agrees to assign all manufacturer warranties that are assignable to the Buyer. Neither the Seller nor the Buyer is obligated to pay for any lender required repairs or remediations, unless both Parties agreed in writing. If repairs will exceed five percent, the lender has the sole option to terminate the agreement. If the Parties cannot come to an agreement for the lender required repairs or remediations, this Agreement will terminate and the earnest money will be refunded to the Buyer within ten days of the receipt of the written notice. The Seller will complete all agreed work, repairs, treatments, and improvements (the "Work") prior to the Closing Date unless both Parties agree otherwise in writing. The Work to be completed must be done by individuals who are licensed to perform such tasks and all required permits and regulations must be obtained and observed. Any transferable warranties received by the Seller for completed Work will be transferred to the Buyer at closing. If the Seller fails to complete the Work prior to the Closing Date, the Buyer may elect to complete the said Work and the Buyer will be entitled to claim reimbursement for the Work from the Seller upon closing. The Closing Date will be on or before April 19th, 2019 or be within seven days after objections revealed from the Commitment or survey have been cured, whichever date is later. In the absence of legal excuse, the failure to close the sale on the Closing Date by either Party will enable the non-defaulting party to pursue any remedies on default provided in this Agreement. Upon closing, the Seller will execute and deliver to the Buyer a general warranty deed which has title to the Property and shows no further exceptions to title of the Property except the Title Exceptions, and furnish a current tax statement which shows no delinquent taxes on the Property. The Buyer will pay the Sales Price in good funds acceptable to the escrow agent. Any notices, statements, certificates, affidavits, releases, loan documents and other documents required by this Agreement, by the Commitment or by law which is necessary for the closing of the sale or the issuance of the Title Policy must be promptly executed and delivered by the Seller and the Buyer. All covenants, representations and warranties in this Agreement will survive closing and may be enforced. Possession of the Property in its current or required state, ordinary wear and tear excepted, will be delivered by the Seller to the Buyer upon proper funding at closing. A tenancy at sufferance relationship will be created between the Parties where there is no authorized written lease agreement and either the Buyer has possession prior to closing or the Seller has possession after closing. The Parties should consult their respective insurance agent and are responsible to ensure adequate coverage exists upon the transfer of ownership and possession. All existing liens; prepayment penalties; recording fees; lender, tax statements or certificates; preparation of deed; half of escrow fee; and all expenses payable by the Seller under this Agreement must be released or discharged accordingly. Loan origination, discount, buy-down, and commitment fees. All expenses related or incident to any loan, including but not limited to, appraisal fees; application fees; credit reports; loan documents preparation fees; recording fees on notes and mortgages or deeds of trust; recording fees on the deed and financing statements; inspection fees; half of escrow fees; all prepaid items including flood and hazard insurance premiums; documentary stamp tax; title policy; and all other expenses payable by the Buyer, necessary to perform the Buyer's obligation under this Agreement must be released or discharged accordingly. Any Private Mortgage Insurance Premium (the "PMI"), the VA Loan Funding Fee, or the FHA Mortgage Insurance Premium (the "MIP") as required by the lender, must be paid by the Buyer. However, the Buyer may not pay charges and fees expressly prohibited by FHA and VA financing or other governmental loan program regulations. If any expense to be paid by either Party exceeds the amount expressly stated in this Agreement, the Party responsible for the said exceeding amount may terminate this Agreement unless the other Party agrees to pay the excess amount. The following items will be prorated and adjusted as property as of the Closing Date: any taxes due for the current year, association fees, maintenance fees, assessments, dues, heating tank fuel, utility charges and rents of the Property. If the tax rate for the current year is unknown, the Parties will use the rate from the previous year plus five percent at closing. If the tax rate for the previous year is also unknown, the escrow agent will estimate an amount to prorate, holdback sufficient funds and adjust the prorated amount when the new tax statements become available. The Buyer will be obligated to pay the share of the prorated taxes for the current year if the taxes are not paid at or prior to the closing. at closing, the Property in its damaged state will be accepted and all insurance proceeds will be assigned from the Seller to the Buyer and the Buyer will receive an amount equal to the deductible under the Seller's insurance policy. The Seller's obligations under this provision are independent of any obligations of the Seller found under the heading Property Condition. treat all earnest money as forfeited and the said money be deemed as liquidated damages and the sole remedy for the Seller. terminate this Agreement and the earnest money will be refunded to the Buyer within ten days as the sole remedy. treat this Agreement as terminated and receive the earnest money within ten days of cancellation. liable for interest on the earnest money. At all relevant times during the course of this Agreement, the escrow agent is required to notify the other Party prior to the releasing of any funds to the Party who is requesting the funds. The notice of the escrow agent to either Party will be deemed effective upon its deposit to any US Postal Service offices or mailboxes with receipt requested, provided that the notice contains adequate postage and the correct mailing address of the Party contained in this Agreement is inscribed on the notice. The notice of objection to the demand of earnest money will be deemed effective upon receipt by the escrow agent. The Seller represents and warrants that there will be no liens, assessments, or security interests from third parties against the Property which will not be satisfied out of the sales proceeds. The Seller makes no representation aside from those expressly provided in this Agreement. If the representations of the Seller are untrue upon the Closing Date, the Buyer may terminate this Agreement and the earnest money will be refunded within ten days. if the Sales Price does not exceed $300,000.00 and the Property will be used as the Buyer's residence. Third Party Financing Condition Addendum. The Buyer may not assign this Agreement without the Seller’s written consent. This Agreement is binding on the respective heirs, executors, administrators, successors, personal representatives and assigns, as the case may be, of the Seller and the Buyer. The effective date of this Agreement (the "Effective Date") is the latter of the date the Buyer executed this Agreement and the date the Seller executed this Agreement. The Parties agree this Agreement will be construed under the laws of Virginia, without regard to the jurisdiction in which any action or special proceeding may be instituted. The spouse of each married Seller consents to this real estate transaction, and will sign and deliver such deeds and other documents as may reasonably be requested by the Title Company to evidence such consent and to effect the transfer to the Buyer of any dower, homestead, elective share, community property or any other rights which that spouse may have in or to the Property. If there is a conflict between any provision of this Agreement and the applicable legislation of Virginia (the "Act"), the Act will prevail and such provisions of the Agreement will be amended or deleted as necessary in order to comply with the Act. Further, any provisions that are required by the Act are incorporated into this Agreement. If any terms or provision of this Agreement are determined to be invalid or unenforceable by a court of competent jurisdiction, the remainder of this Agreement will not be affected and each unaffected term and provision of this Agreement will be valid and be enforceable to the fullest extent permitted by law. There are no obligations on either Party for the payment of broker fees in this Agreement. The Parties agree that no real estate brokers or agents were procured for their services in connection with this Agreement or any part of the sale agreement prior to the signing of this Agreement. If a broker or agent was retained, the Party which employed the said broker or agent will be solely liable for the costs associated with it. This document constitutes the entire agreement of the Parties and it may not be contradicted by evidence of prior, contemporaneous or subsequent oral agreement. The provisions contained in this Agreement cannot be changed except by the signed and delivered written consent of both Parties. The Seller and the Buyer should consult an attorney before this Agreement is executed if any aspect of the Agreement is not understood. The Seller and the Buyer agree each will notify the other of the contact information for the respective attorney, if any, responsible for this real estate transaction. All monetary amounts in this Agreement refer to US dollars, and all payments required to be paid under this Agreement will be paid in US dollars unless the Parties agree otherwise in writing. Headings are inserted for the convenience of the Parties only and are not to be considered when interpreting this Agreement. Words in the singular mean and include the plural and vice versa. Words in the masculine gender mean and include the feminine gender and vice versa. Words importing persons include firms and corporations and vice versa. Time is of the essence in this Agreement. Every calendar day except Saturday, Sunday or U.S. national holidays will be deemed a business day and all relevant time periods in this Agreement will be calculated in business days. Performance will be due the next business day, if any deadline falls on a Saturday, Sunday or a national holiday. A business day ends at five p.m. local time in the time zone in which the Property is situated. EXECUTED by _______________ on the _______ day of ___________ , 20____ . The Receipt of $__________ as Earnest Money in the form of __________________ is hereby acknowledged on this _______ day of ______________, _______. This list serves as a reminder of some of the items and common issues that the parties need to keep in mind during the completion and execution of the Real Estate Purchase Agreement (the "Agreement"). Please take the time to go through the checklist and take note of the necessary items that need to be provided to the parties. Ensure both the Seller and the Buyer have read through and understand the Agreement and any necessary addenda. Note that there may be additional disclosures under the Real Property Disclosure section of the Agreement. Both parties should initial at the bottom of each page of the Agreement after reading it. The witnesses do not need to witness each page. What is a Real Estate Purchase Agreement? A Real Estate Purchase Agreement is a contract used to outline the terms of a residential property deal between a buyer and a seller. It may only be used for residential properties where construction has been completed. Who needs a Real Estate Purchase Agreement? You may use a Real Estate Purchase Agreement for any type of residential property purchase or sale, as long as the home has either been previously owned, or construction will be finished prior to the closing date on the contract. 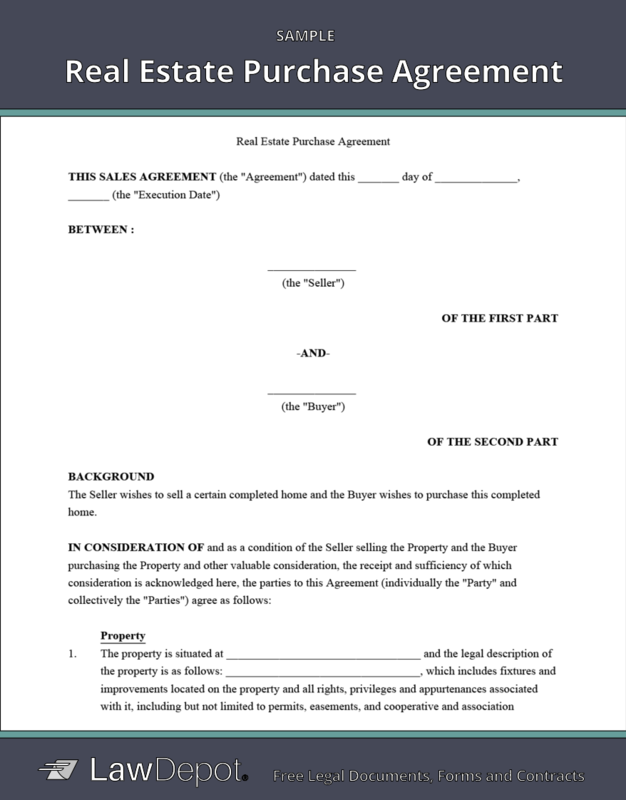 What is included in a Real Estate Purchase Agreement? By using LawDepot's Real Estate Purchase Agreement, you can customize every aspect of your contract to suit your specific situation and property. How can I finance real estate? Third Party Financing: This is when a bank or other lending institution provides a loan to the buyer which must be paid back over time. This is the most common way to purchase a new home, but approval depends on the buyer's credit rating, job history, and current financial situation. Seller Financing: Sometimes, a seller will provide financing to a buyer who is unable to obtain a loan from a financial institution. This is often the case when a seller has paid off their mortgage, and a buyer simply pays them a pre-determined amount in intervals until the agreed upon price has been paid in full. Assumption: Assumption is when a buyer assumes, or takes over, the seller's mortgage. This means that the home loan transfers to their name, and they take financial responsibility for the remainder of the mortgage. Assumption often requires that the buyer is qualified to take over the loan under the lender's guidelines. No Financing: No financing is required when a buyer will be purchasing the residential property in full using their own funds, and will not require a loan. What is Earnest Money? Earnest money is the deposit which a buyer puts down to show their interest and seriousness in purchasing the residential property. If the contract is fulfilled, the amount is credited to the purchase price. If the sale falls through, the money is given back to the buyer. What is Escrow? When you purchase a property, it is held by a third-party until the closing or possession date. It keeps the property, and any funds, from changing hands until all aspects of the agreement are met, such as home inspections, insurance information, and financing. 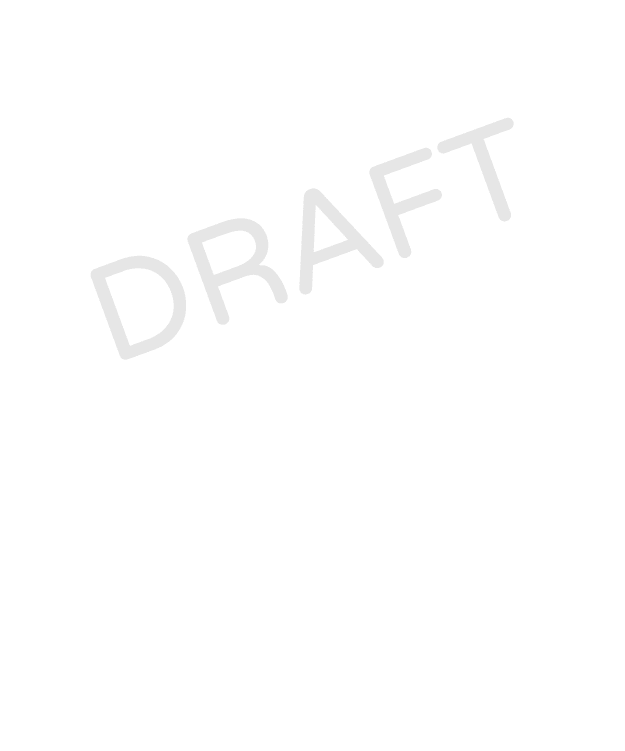 Personalize your Real Estate Purchase Agreement template.